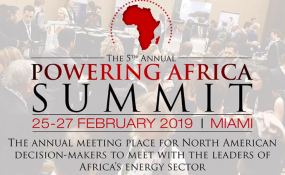 The 5th Powering Africa: Summit will host over 370 investors and public and private stakeholders from across North America, Africa and Europe to present energy projects, discuss investment opportunities and build relationships within the international power community. The Powering Africa: Summit (PAS) to take place for the first time in Miami from February 25-27 will be attended by delegates of the World Bank, OPIC, MCC, Power Africa, USAID and USADF alongside African energy leaders from Morocco, Ethiopia, South Africa, Kenya, Uganda, Mozambique and Nigeria. Participants will discuss new innovative partnerships to implement the Power Africa Initiative launched by former US President Barack Obama five years ago. The initiative seeks to provide 60 million households and businesses across Africa with access to electricity and add 30,000 MW of power supply by 2030. The initiative comprises a consortium that includes more than 120 governments, companies, NGOs and academic institutions. “With dozens of partners and government officials from all over the world attending we have seen deals get unstuck, in real time, at the Summit,” Andrew Herscowitz, Coordinator of the summit said. The meeting will also examine: How Florida shaped its energy mix. There will be a special spotlight on Ethiopia – A country united: With projects such as Dii (Desert Solar) and the potential of Sub-Saharan countries to develop massive solar farms.